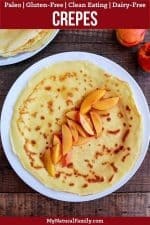 These Paleo crepes and quick and easy and actually work, like they are actually pliable and taste almost like a “normal” crepe. These crepes are actually pretty life-changing. I mean, it’s a “normal” person food that’s quick and easy and actually turns out. Make sure your pan isn’t too hot. If it’s too hot, you will basically make scrambled eggs. It needs to be thoroughly pre-heated at medium heat, swirling the batter in the pan to get a nice even coating, and waiting until the top is almost completely cooked before flipping. A lot of the reason I like these Paleo crepes better than others I have tried is that they have two different kinds of flour. I’ve found a lot of people in Paleo cooking try to use only one flour, which just doesn’t work. You can taste that one flour too much and none of the Paleo flours have the same properties as wheat flour, but when you use more than one type of flour, you get the best of both worlds and can’t taste any one type of flour. Go ahead and give them a try and see if they don’t become a staple in your house! I would love to know in the comments how you like to eat these crepes. 9 Easy and Quick Paleo Breakfast Recipes, They’ll Knock Your Socks Off! Best Paleo Recipes Pinned Over Half a Million Times!!!! These Paleo crepes are quick and easy and are actually pliable. In a mixing bowl, whisk together coconut milk, coconut oil and eggs. Add tapioca flour, coconut flour and a pinch of salt. Beat until smooth, the batter should be thin. If it’s not thin, add some water. Heat oil in a crepe pan over medium heat. Pour ¼ cup of batter for each crepe,tilt the pan in a circular motion to spread the batter evenly. Cook crepe for about 2 minutes, or until bottom is golden brown. Turn crepe and cook on the other side until golden brown. Top with fruit and maple syrup. Just made for the first time – these are AMAZING! I made them smaller, and it took be a couple of tries to get the hang of flipping them (Got to test those) – but man – are they delicious! I’m so glad the recipe worked for you. 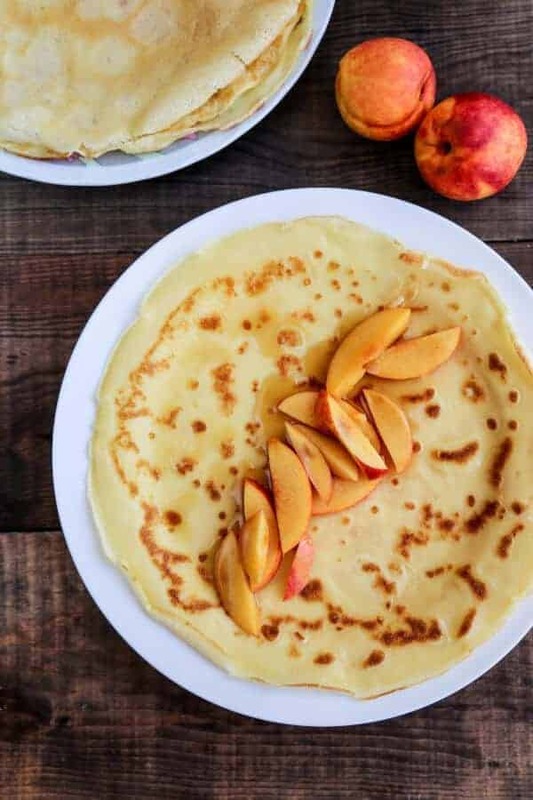 Love the idea of making them smaller crepes can be tricky and Paleo crepes can be even tricker but I’m glad you didn’t give up and gave them a try. Thank you for the wonderful recipe. I used Almond milk as I did not have coconut milk with me and swap Tapioca flour with Arrowroot. It taste wonderful depute the changes. Love the chewy texture. Will definitely be a regular for my kids. I’m so glad you like the crepes! I love how they are chewy too. Thanks for commenting. 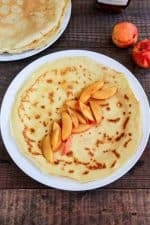 What an amazing crepe recipe! Thank you for adding the nutrition information at the end of your recipes. 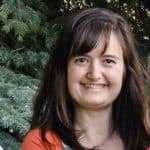 I’m a T1D and have to count every. single. carb. This recipe contains 31g of carbs (25g net carbs) per serving. How many crepes is a serving? I just said this whole recipe makes 4 servings, so however many crepes that makes, depending on the size of them. I ran out of coconut oil so I replaced it with grass-fed butter. They turned out great!Good texture and delicious! Good to hear! Thanks for your comment.